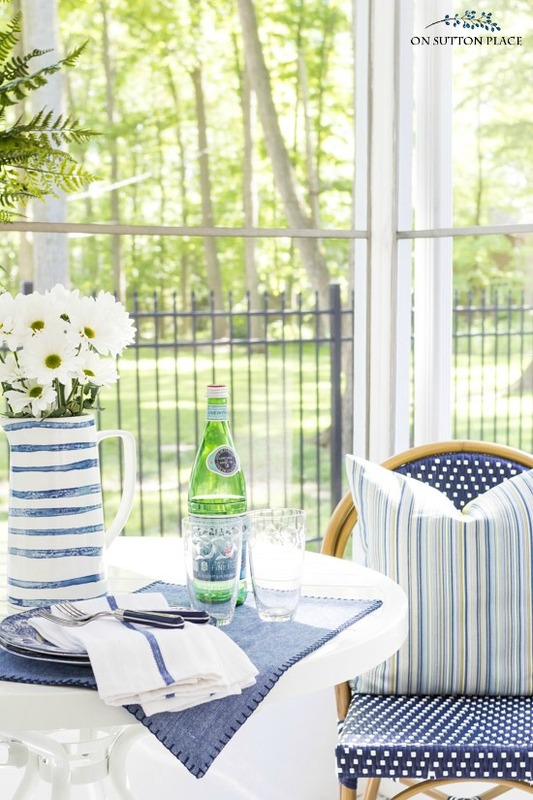 Use these screened in porch ideas to make your outdoor space live like an indoor room. Includes easy, budget-friendly tips and decor inspiration. 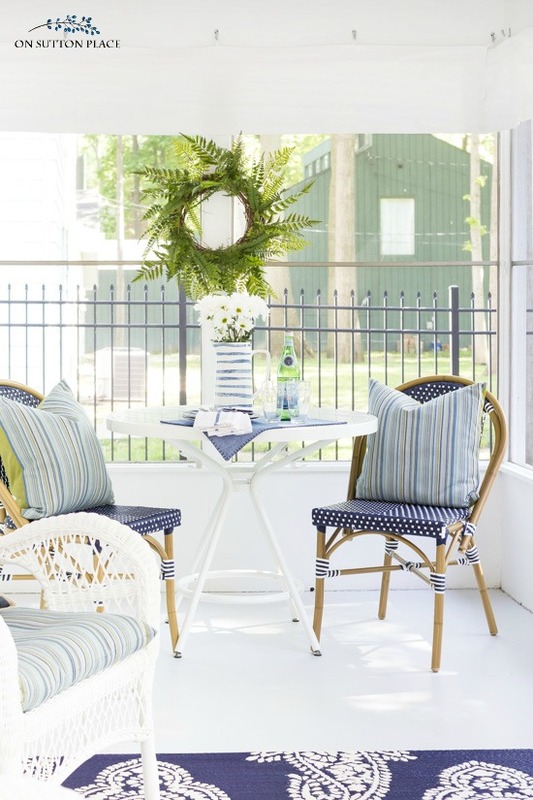 Welcome to summer on the porch! Today I’m joining Jennifer from Town ‘n Country Living, along with an amazing bunch of decor bloggers, and we’re sharing our summer colors. I’m sure it’s no surprise that my colors for this summer are blue and white. I just completed a porch makeover and have some screened in porch ideas to share along with the room details. I started this back porch project with a blank slate. The only thing in the porch when I began was the white chest. My goals for this makeover were to have completely maintenance-free decor and to achieve a simple, functional space. I didn’t want tons of pillows or long curtains. I wanted it to be easily assembled in the spring, and easily put away in the fall. Everything I purchased is made from weather-proof materials. Even the rug is made from 100% polypropylene so it can be hosed off if it gets dirty. The wicker chairs are resin, the round table is a very heavy metal, and the bistro chairs are aluminum/resin. Nothing will ever need painted which is a huge relief to me. I wanted a small sitting area and an area for a table with chairs. Because the room is sort of long and narrow, there wasn’t a lot of choice for furniture placement. The sitting area was put together around the chest and was grounded with the rug. The table and chairs fit nicely at the end of the space. The chairs all came pre-assembled but I had to put the table together. It took some time but once I got started, it was relatively easy. Of course, if you have a handy husband or teenager lurking around, it’s the perfect way to put them to work! I didn’t have a set budget in mind, but since I started with basically nothing, I knew it was going to cost between $500 – $1000. I was very careful about shopping around and trying to find budget-friendly items. It’s a small space, it’s only used for a few months, and no one uses it except me. It just made no sense to invest a ton of money. The total cost of this screened in porch makeover was just over $700.00. The round table was more than I wanted to pay, but in the end, it was a good decision. The table is sturdy and heavy which is what I wanted. The bistro chairs were a splurge, but I love them so I don’t feel guilty at all. I was able to reuse cushions and pillows which helped at the end when I was tired of spending money! Blue striped pitcher: no longer available. Decorative bee skep: purchased locally. Sign up for the Overstock email list and get a 15% off coupon. The story of my garden gate. The best sources for farmhouse style pillows. 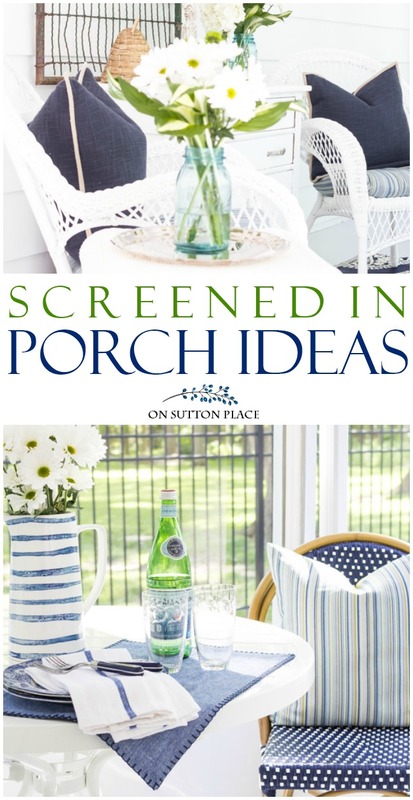 If you have any helpful screened in porch ideas of your own, please share in the comments. I’m always looking for ways to make this outdoor space easier to maintain. I hope you have a few extra minutes to check out the links below. I will be updating them as the week progresses so check back! « Container Herb Garden Ideas: Grow Your Own! Your blue and white porch is classic. The maintenance free aspect caught my attention. Our back porch is open, not screened in, and everything gets dirty quickly. 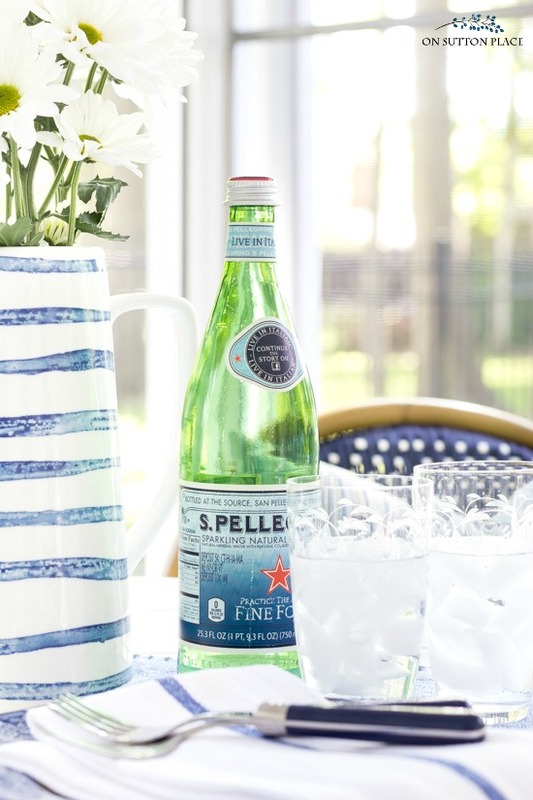 I love all your blue and white home decor! You are such a lovely person. You are so talented and I love all of your ideas! I just purchased a set of your Christmas tree pillows from Society 6 and I can’t wait to put them out on my front porch rockers for the Christmas season. And please keep those e-mails coming because It’s something I look forward to on my weekends. Hello, I love On Sutton Place, you cover all the bases! I look forward to every e mail……..
Ann, Thanks for inviting me to your back porch. I love blue for summer. And you have created a summery sanctuary that will work well into the fall! Just beautiful! My favorite words in this post are “maintenance free”! YOU GO GIRL! I love being outside in the summer until the humidity sets in and then I just want a place like yours to rest and read! Ann, your porch is stunning! It is so cool, fresh and inviting. Summer living at its finest! It’s beautiful. I hope your husband or someone enjoys the space with you. Ok, I’m so drooling over all your decor. 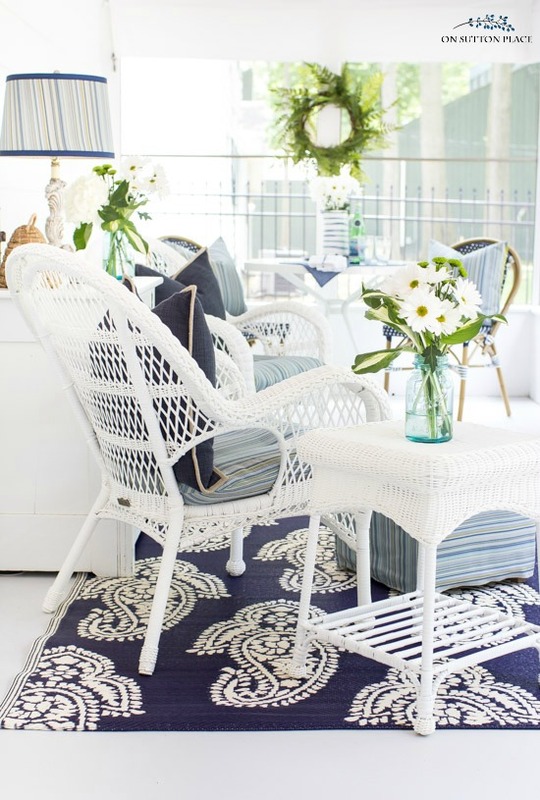 Your rug and the bistro chairs are so pretty and add such a light and summer touch. I love how you shared your budget and how you built the room from scratch, it’s awe-inspiring! Ann, your ideas in all of your blogs always catch my eye. I really enjoy your decorations. I hope the weather stays comfortable in your area and you can enjoy your beautiful porch. It has been around 90 degrees here,a little to warm for porch sitting. I found vase with blue horizontal stripes (similar but nor the same) by putting “blue stripes vase” into an Amazon search. I did not buy it but I saw someone ask about it. The porch is lovely. It’s all very lovely, Ann. Such a beautiful screened porch, Ann! You made great use of your space and I love that everything you chose is weather resistant. Thanks so much for joining today’s tour!! Love the blues, Ann! It seems to be my favorite color of late. Everything is well done! 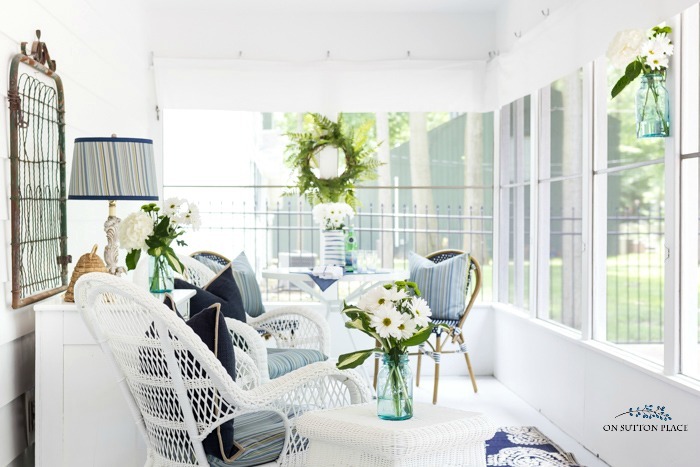 I’ve always loved screened porches and love how you’ve decorated yours. Everything about it just makes my heart smile. 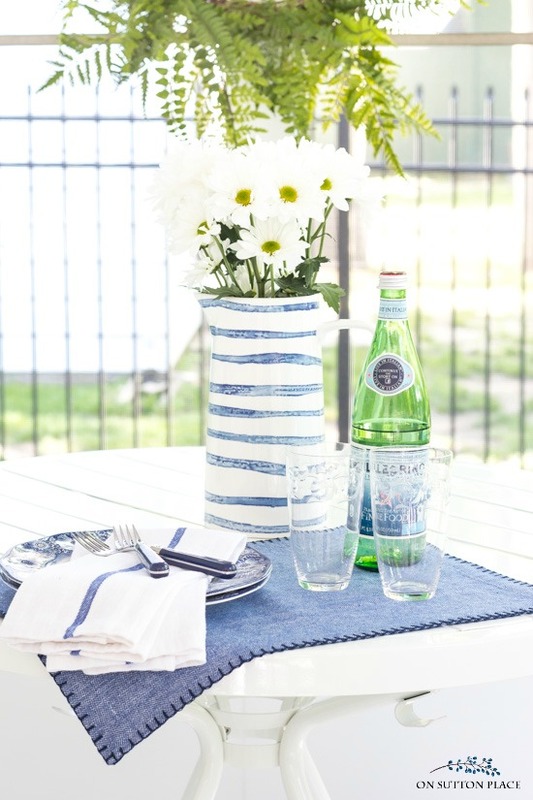 There’s something about blue and white that always looks so fresh and welcoming. I love your style. Thank you for sharing your space with all of us. ann, what a pretty porch showered in all that pretty blue. enjoy it. 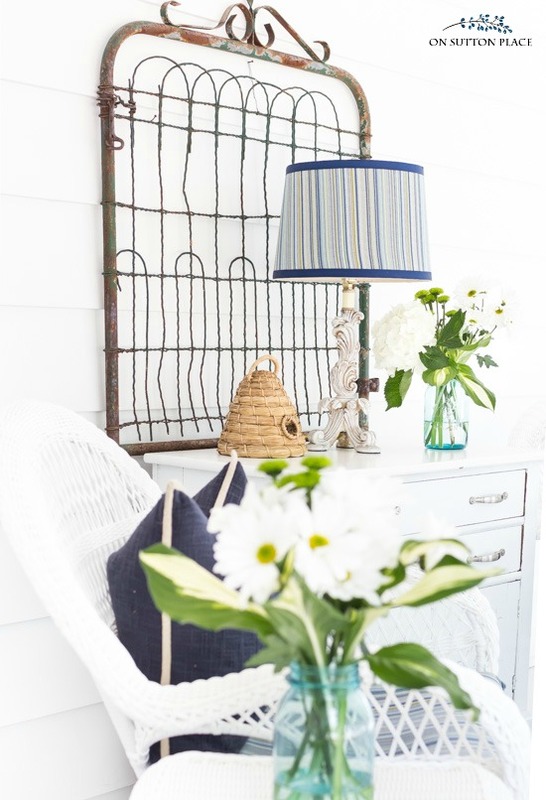 The porch is beautiful and so inviting and love all the accessories, particularly the old iron gate and the blue striped pitcher and the beehive! Ann, what a perfect makeover!! The porch is lovely and welcoming and the easy upkeep is such a bonus! Yet you didn’t sacrifice style at all. I particularly love the vignette around the chest and that great piece hanging above it. Well done!! I’m happy to see the chest and gate with your pretty new porch furniture. Easy care a good thing too! Ann, your porch is just so beautiful! What a lovely job you have done! I enjoyed reading your “gate” story! How nice! Hope you get lots of time to enjoy your lovely porch this summer! Blessings! I was just telling my urban daughter about your site. You have such classic tastes and your ideas are so appealing to everyone’s lifestyle. Very sweet and fresh porch remodel. It looks like the perfect place to spend summer mornings and evenings, or as a respite after some serious gardening. Very inviting! Lovely Ann! You have an eye for decorating and making you’re home fresh and inviting. Such a lovely, refreshing living space! Your porch turned out lovely.Love the gate over the chest.Enjoy your new tranquil space. Love the old metal gate on your porch. Just want to share that I’ve made small bouquets of hosa leaves and daisies for the table for book club. They will also be eating your recipe for strawberry cheesecake parfait. I enjoy your decorating and food and know the book group will too. Have you ever made Hummingbird bread? No…what is hummingbird bread? It sounds interesting! I love all your pieces and how that gorgeous rug pulled it all together! Enjoy your beautiful space! What a most beautiful porch Ann! You did an amazing job with your budget. 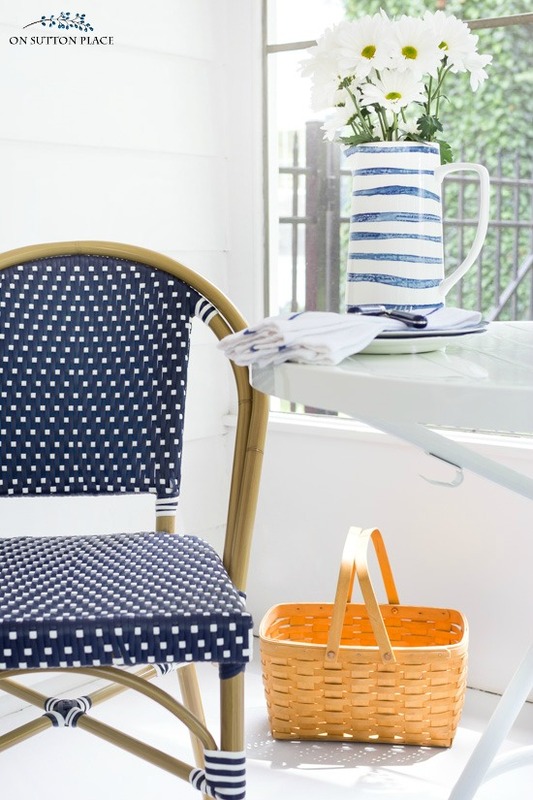 I am in love with those chairs with the navy and white polka dots! So fun! You have a beautiful way of mixing patterns to create a most lovely space….and must say I have always love the gate over the chest! Have a great Holiday Ann! Thanks as always for your wonderful inspiration! Love it all! What a wonderful retreat to relax in and enjoy. I like that it’s not overly done as you say with pillows, and other decor. It’s just the right amount and low maintenance. Thx for sharing your talents! It is sooo lovely! You did a great job! What a wonderful “sanctuary “. As much as I love porches and the wonderful colors of blue and white. I get teased about all my blue and white color schemes but it is always very crisp and clean looking. Plus all flowers go with blue and white. That’s why God made the sky blue. Ann, I hear ya about making things easy. I love your blue and white choices and I’m really the only one who uses our deck. Occasionally my husband may come out for a few minutes. Ann .. your porch is so beautiful…. I love everything but mostly I love your gate that your Daughter gave you…… were you put it under your Grandma’s chest. It all means Family and you have made a very comfortable place to enjoy your garden. What a lovely place to just chill. I really have to go to World Market!!! They do not have this store in Ontario. Love it Ann! Let the summer begin! 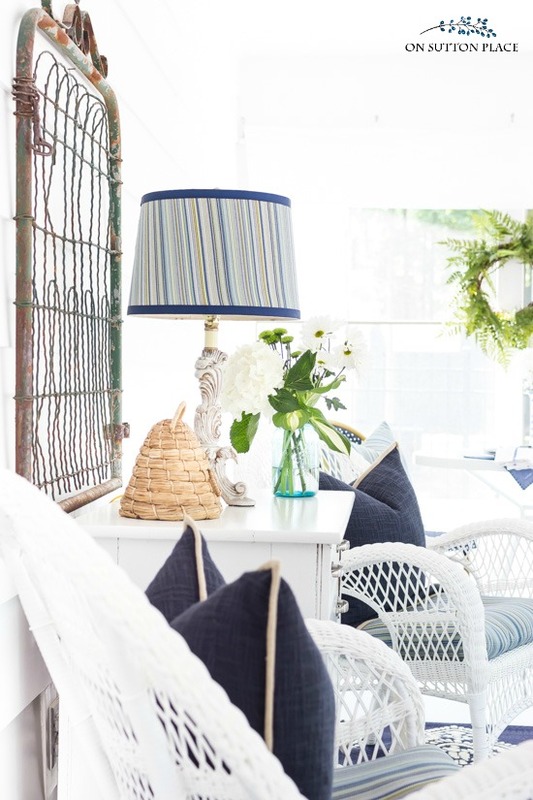 I always love blue and white, hope to order the navy pillows today. I can practically taste ice tea already. So pretty!! Hope you get to spend lots of time enjoying your porch this summer!! I always enjoy the inviting charm that your home exudes Ann and I would sit on your porch with you any summer day!